A view of China's Tiangong 1 space lab module taken by the approaching Shenzhou 8 spacecraft, just minutes before the two vessels docked in Earth orbit. This story was updated at 2:05 p.m. EDT. A pair of robotic Chinese spacecraft docked in orbit for the first time ever Wednesday (Nov. 2), marking a key step toward China's goal of building a space station and establishing a permanent manned presence in space by the end of the decade. After a two-day orbital chase, the Shenzhou 8 spacecraft latched onto a prototype space lab module called Tiangong 1 at 1:30 p.m. EDT (1730 GMT; 1:30 a.m. local time Thursday in China). Ten minutes later, the docking was complete. "Tiangong 1 has joined Shenzhou 8, has completed the rendezvous and docking process, and I announce the docking of Shenzhou 8 and Tiangong 1 has been a complete success," said Chang Wanquan, chief commander of the China Manned Space Engineering Project. The historic meet-up was designed to test technologies that China will use to assemble a space station in orbit, which the nation hopes to have up and running by 2020. "We can never count on other countries to sell their mature technologies to us, so we have to rely on our own," Zhou Jianping, chief designer of China's manned space program, told China's state news agency Xinhua before Shenzhou 8's Monday (Oct. 31) launch. The docking was regarded as such a big deal for China that president Hu Jintao, who is attending the G20 summit in France, sent a statement that was read aloud at Chinese mission control. "I'd like to send my congratulations and greetings to all those who have made this possible," the statement read in part. "To master the technology of rendezvous and docking will push forward China's manned space program. I hope all the persons involved in this will continue their efforts in a united way to make the whole mission a complete success and to make continued efforts for China's manned space program." Chinese TV shows the Tiangong 1 module docking with the Shenzhou 8 spacecraft Nov. 2, 2011. After blasting off from Inner Mongolia, Shenzhou 8 set out to track down and hook up with Tiangong 1, whose name means "heavenly palace" in Chinese. Engineers controlled the first part of the chase from the ground, directing Shenzhou 8 to perform five separate maneuvers to get close to its quarry. China now joins a group that includes the United States, Russia, Japan and the European Space Agency, all of which have designed spacecraft capable of docking in orbit. The two Chinese spacecraft will now circle Earth together for the next 12 days. 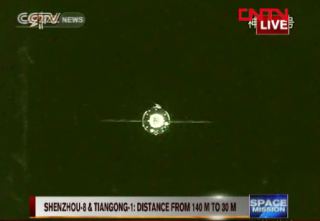 Then, Shenzhou 8 will detach, retreat to a distance of about 460 feet (140 meters) from Tiangong 1, and dock again, to prove the effectiveness of the technology beyond a shadow of a doubt. The second docking will last just two days, after which Shenzhou 8 will depart Tiangong 1 for good. The spacecraft's return module will then come back home to Earth in mid-November for inspection and analysis. Wednesday's Chinese spacecraft docking was the second orbital rendezvous of the day. Russia successfully docked a robotic cargo ship to the International Space Station at 7:40 a.m. EDT (1140 GMT). Chinese Mission Controllers watch as the Tiangong 1 spacecraft makes the country's first docking maneuver with Shenzhou 8. China hopes to replicate its Shenzhou 8 success with two more docking missions, which are slated to launch before the end of 2012. At least one of those missions, which are called Shenzhou 9 and Shenzhou 10 (Shenzhou translates as "divine craft"), will be manned, Chinese officials have said. In 2003, China became the third nation, after the United States and the Soviet Union/Russia, to launch a human to space. It then lofted two more manned missions, one in 2005 and another in 2008. So far, all of China's "taikonauts" have been men. But that could change with one of the next Shenzhou flights, as China's Xinhua News Agency has reported that two women are on China's active spaceflyer roster. China views Shenzhou 8 and other upcoming docking missions as key steps in the nation's plan to assemble a manned space station in orbit by 2020. China's vision calls for a 66-ton structure — slightly smaller than the United States' Skylab station, which launched in 1973. For comparison, the International Space Station weighs about 431 tons. "What you’ve seen today is a major step in the development of a large space station," said planetary scientist John Lewis of the University of Arizona, who appeared as a commentator on Chinese state TV station CCTV. "As you can certainly imagine, it is far from the last step. Many, many possibilities are opened up by demonstrating this capability."